Selected speakers will have 6-minutes to present and must provide final PowerPoint presentations by the August 14 deadline. 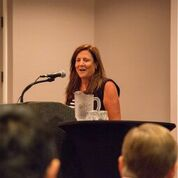 Presenters will be introduced by the session moderator and will have a podium, microphone, and a slide advance remote provided. Presentations will be timed. The 6 minute mark is a HARD STOP. If time permits, there may be a brief Q&A after the presentation. Researchers and/or research institutions owning intellectual property rights for technology and seeking to license or commercialize it. Enterprises or businesses with advanced, proprietary technology seeking seed or venture capital or commercial licensing partners. Learn what goes into developing and making a quality pitch deck that you can use when pitching your UAS technologies to potential investors, licensees and strategic partners during the 2019 UAS Tech Forum, August 21-22, in Salina, Kansas. Panelists for the Pitch webinar are Jeff Carpenter, principal of Bird Dog Innovation Strategies, and former Pitch presenter Johnie Johnson, president & CEO of Helo Perspective. To register for the March 13 webinar, please visit https://bit.ly/2XtFhYs. Power Point presentations are due at this time and should be emailed by 5:00 p.m. ET. Presenters will make their initial PowerPoint presentations via scheduled conference calls. This is required. Failure to schedule and complete a dress rehearsal presentation may result in forfeiture of presentation slot. PowerPoint presentations are due at this time and should be emailed by 5:00 p.m. ET. Please also bring at least one backup of the entire presentation on a USB Flash Drive with you to the conference. 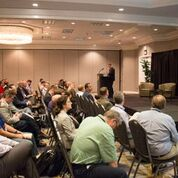 Whether you are a scientist or entrepreneur seeking to commercialize a technology with an application in the unmanned aerial systems industry, the UAS Tech Forum provides a unique opportunity to showcase your technology and network with investors, licensees, and strategic partners. 6 minutes at the Tech Forum to present your commercialization and/or licensing opportunity to an audience of investors, licensees, and strategic partners. A teleconference dress rehearsal of your presentation prior to the event. The dress rehearsal provides crucial feedback and helpful advice to produce the most effective presentations possible. A platform to leverage your 6-minute investor-oriented presentation for a variety of marketing purposes. Your company or research institution succinctly described in the conference materials handed out to all attendees. Complimentary pass with full access to the 2-day event including the opening plenary, luncheon and receptions. Follow the link below to set up a profile and submit your pitch idea for presentation in our 2019 UAS Tech Forum. Deadline to submit is Friday, April 12, 2019.